Custom fields let you collect and store any kind of information for your employees, from favourite ice cream to license numbers to important dates. For each custom field you can set rules around who can see the field, what type of field it is, and who should fill in the information. From your dashboard, go to the People app. In the navigation menu on the left, click "Custom Fields". 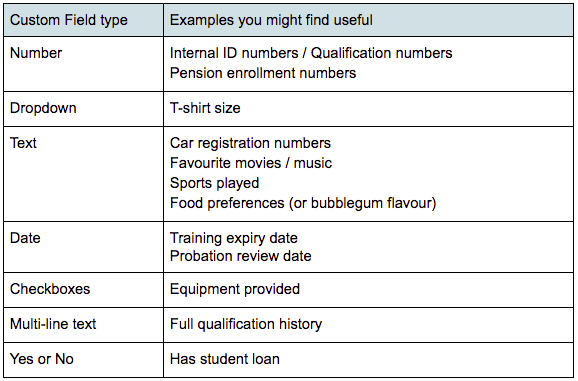 Here are the types of fields you can use along with examples of what you could use them for. After you create a custom field it will appear on employee profiles in the "Other" section. You can also choose to have the field appear in Employee Onboarding or when you add a new employee. Note: once a custom field has stored information, you won't be able to edit the "Type" of field (e.g. change "Single Line Text" to "Dropdown"). Does field appear in the new employee flow: "Yes"
Who should fill out field: "Employees"